When we needed to bring in some new bloodlines Curbstone Valley was our first consideration. 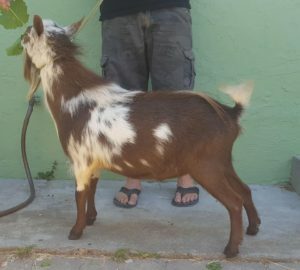 We have so much Castle Rock in our herd that it was getting difficult to find a buck that we could use. Curbstone Valley has lovely animals that produce well and we trust the care they put into their herd. They also have a lot of Castle Rock but they do have some outside lines. 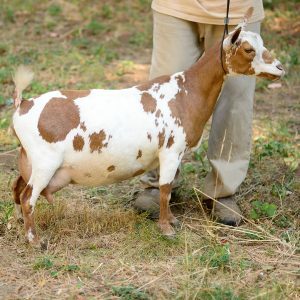 Tig’s dam, Ocean is a lovely doe that really puts it in the milk pail. 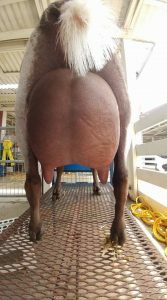 She consistently passes on her productivity to her daughters along with lovely mammary systems that are high and wide in the rear – something we could definitely improve upon in our herd. She has proven herself in conformation as well, earning her permanent score of EEEE 91. His sire’s dam, Neve, is one of my favorite does in the Curbstone herd. She has tremendous body capacity, even when she was just a first freshener which is another thing we need to improve on. 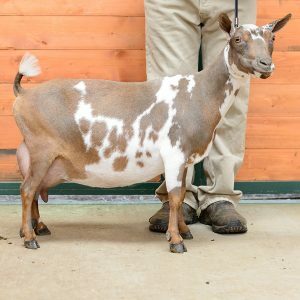 Neve is full sister to the dam of the 2015 National Champion. So when we had a chance to bring in the genetics of both Ocean and Neve we jumped at the chance. His first kids hit the ground in 2017 and they looked great! We retained his daughter, Dog Island Dark Moon. 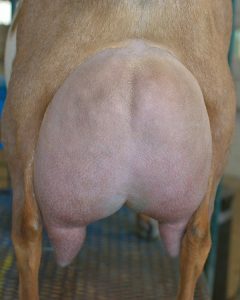 Tig's maternal half sister, Curbstone Valley Calypso's first freshening udder.